The State Fine Art Collection, also known as the Alice Art Collection, was initiated by Representative Alice Merrill Horne who served in the 3rd Utah Legislature in 1899. She sponsored the legislation that created the Utah Art Institute, now known as the Utah Division of Art and Museums, the first state-sponsored arts organization in the United States. 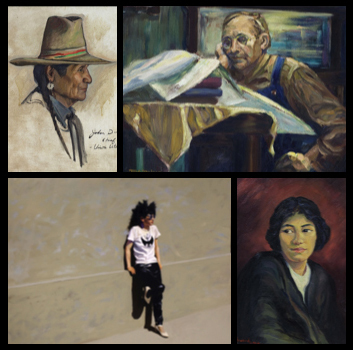 People of Utah features a selection of portraits from the Collection. More than appropriate in the “People’s House,” these artworks reflect a beautifully diverse sampling of the people and artists of Utah. Styles range from 19th-century painting to 21st-century mixed media on canvas and bronze sculpture. Artists in this exhibition include but are not limited to: Gordon Cope, William J. Parkinson, Brian Kershisnik, Roscoe Grover, Steven Pawson, Downy Doxey, and Mary H. Teasdel.